Missoula  is a medium size city in Western Montana with a population of about 70,000. The hub of five valleys in the northwest region of the state, or Glacier Country, the town boasts the University of Montana, the Rattlesnake Wilderness Area, and a multitude of recreational opportunities, along with an active and colorful downtown. Though physically part of the Rocky Mountains region, culturally Missoula identifies closely with the Pacific Northwest. Home to the University of Montana  and often considered by residents as the most liberal city in Montana, it's an interesting mix of ranchers, cowboys, hippies, yuppies, students, artists, athletes and recreationalists. Graduates from the University of Montana frequently remain in Missoula, creating a large over-qualified work force. A local barista or cook may have, at the very least, a Bachelors degree. Tip well; they have loans to pay off! The easiest way to Missoula is by air. Major hubs that service Missoula's International Airport (IATA: MSO) include Salt Lake City, Denver, Minneapolis, San Francisco, Chicago and Seattle. Missoula can be reached by car via US Interstate 90, or US Highway 93, which runs north - south from the Idaho border at Lost Trail Pass all the way to Alberta, Canada. US Highway 12, which follows the Lewis and Clark trail on the west to and from Idaho, provides access to unspoiled wilderness areas and great scenery. Be advised that road conditions in Montana can be very hazardous in the winter, and if you are not accustomed to driving winding mountain roads or in extreme snow/ice/sleet/hail/rain conditions, you should exercise extra caution. 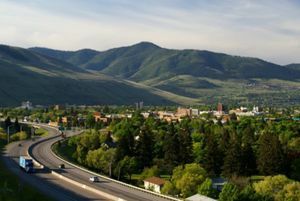 Visitors to Missoula often remark that the city is hard to get around in by car, a fact Missoulians famously owe to conflicting city engineers at the turn of the century. The confusing roadways make the city bus system a great way to get around for only a dollar, but with a little orienting, the city can be much more easily navigated. Higgins Avenue runs from downtown in the northern end of town through the outskirts of the tree-lined streets of the university district until it takes a sharp curve to the west in the south end of town, leading mainly to residential areas. Broadway Street runs east to west, mostly along the Clark Fork river, from Van Buren, entrance to the Rattlesnake Recreation Area and the hippest place to live in town, through downtown before bisecting with Highway 93 and continuing on to the airport and I-90. Orange Street runs through downtown and another treed residential area before intersecting with Brooks Street. Brooks Street begins as Highway 93 from Lolo to the south of Missoula before turning into Brooks Street, a major shopping area populated with strip malls, fast food restaurants and the like, before dead ending into Higgins in a particularly confusing no-right-turn intersection. Russell Street runs north - south from Broadway to 39th, through residential, industrial and business districts, but is a main roadway for motorists. Reserve Street runs from I-90 to 39th from the north - south, crossing Broadway, 3rd Street, South Avenue and Brooks Street before dead ending. Major box stores, such as Target and Wal-Mart, as well as movie theaters, restaurants and other businesses line the thoroughfare. Geographically, Missoula is dominated by the scenic Clark Fork river that flows through downtown and the mountains ringing the city. The Kim Williams Trail, which follows the waterfront, is an easy way to appreciate the former. Tubing, rafting, and canoe/kayaking are also good options in the summer. Mt. Sentinel, on the east side of town, offers a scenic trail system. A trail starting at the University of Montana leads 700 feet up the mountainside to the “M,” which offers great views of the city. More adventurous hikers may continue another 1400 feet to the peak of Mount Sentinel, which offers great views of the city, the Rattlesnake Wilderness to the north, and Mount Jumbo to the north. Those with binoculars may perceive the ancient shoreline of Lake Missoula on Mount Jumbo, marking the edge of an enormous ice-age lake. One can also take the trail off the backside of Mt. Sentinel, which zig-zags down crossing the parasailing jeep road a few times to a sign which shows the lovely trail down thru forest on Sentinel's north side that ends at the old railroad tracks, now the Kim Williams hike/bike trail, and then back to the parking lot at the "M" trails base. Doing the loop in reverse is also very pleasant. Manmade scenic attractions include the Missoula carousel in Caras Park, the historic courthouse, a fine old train station (closed to the public) and several fine art galleries. The Missoula Art Museum is also worth a visit. Knowing that it could never outbid its big-city counterparts for works by famous artists, the museum has instead hosts regularly-rotated exhibits of Western art and works closely with community arts groups. Furthermore, the price is right for visitors, as demonstrated by its slogan: Free Expression, Free Admission. Lastly, if you enjoy history both of Missoula's historic railroad stations still stand, preserved, and in use. One, built by the Chicago, Milwaukee, St. Paul & Pacific Railroad  is currently used by the Boone & Crockett Club and the other built by the Northern Pacific Railway  is used as office space by local businesses and home of the Missoula Farmer's Market during the summer months. Missoulians enjoy a range of outdoor activities including hiking, rafting, "tubing", rock climbing, skiing, fishing, golfing, and just about any other activity that can be done outside. It's no wonder—in Missoula you can take a city bus to within walking distance of federally designated wilderness area. After hiking and returning to town, you can visit the historic downtown and enjoy some fantastic local food and drink. There are a number of summer cultural events worth noting: the International Choral Festival the River Roots Music Festival, Farmer's markets (three) every Saturday morning. Music and food festivals at Caras Park (off Higgins on the banks of the Clark Fork) Wednesday lunches and Thursday evenings and the Western Montana Fair in August. Snowbowl, at 7,600 feet, is a great place to ski that is very affordable. Year-round 'First Friday' finds art galleries open to strolling passersby with music and food offered for free. The public library on Main Street has special talks and presentations, about Montanan history, for example. There is also a movie 'Cheap date' night with popcorn and a drop-in Scrabble Club Monday evenings. Thanks largely to the city's vibrant arts community, the downtown offers a wide variety of unique shops. Visit on a Saturday if possible, when there is a street market and farm market. The downtown Army Navy store offers good deals on an array of outdoors gear. Larger outdoor gear stores are available on Reserve Street, domain of Missoula's big box stores. The best stores feature local goods from Montana artisans. The Good Food Store  - Missoula’s answer to Whole Foods. Sells natural, organic, and specialty foods in its grocery store and includes a small deli serving prepared meals. The Old Post  - Great food, great microbrews, great live music, and terrible lighting--this place has “atmosphere” written all over it. Excellent vegan and vegetarian dishes. Try the weekend brunch. The lunch-only "Reccession Special" is a local favorite. The Iron Horse  - Modern restaurant with good American food (expect to pay $7-10 for lunch dishes and $15-20 for dinner) that turns into a popular sports bar at night. Taco Del Sol - Large $5 burritos. Where many of locals grab a quick bite. The Bridge  - Unusual pizzas sold by the slice. $2.50-3.50 a slice. Taco Sano - locally owned Burrito shop, good combination of value and quality. Dubbed Taco Sysco, after the name of the food distribution company the restaurant gets their frozen meat from. #1 Gyro - Ran by a Greek family, #1 Gyros can be quite crowded around lunch time. Best french fries in town. El Diablo - Another excellent burrito restaurant. Burritos cost around 7 bucks, but worth it. The only burrito shop in town that cooks their meat fresh. Liquid Planet  - A very unique all-beverage store and organic coffee shop with a one-of-a-kind 10 foot high wooden globe that houses wine. Pita Pit - located downtown on Higgins, open until 3am seven nights a week. Come here late night to observe frat boys and hipsters at their worst. Wordens Deli  - Full service deli, coffee, wine, and groceries. Missoula's first grocery store, Wordens opened it's doors in 1883 and has been a Missoula staple ever since. Wicked Philly is a local favorite. Big Sky Brewery, distributes to multiple states. Their most famous brew is called "Moose Drool", but all are good. Visit the taproom for specialty brews not distributed elsewhere. Bayern Brewing, specializes in German lagers. Kettle House,  is a much smaller neighborhood brewery, with excellent beers as well. Lolo Peak Winery,  for fruit wines. Ten Spoons Vineyard,  is another local favorite. Lake Missoula Cellars, . Another Great Montana Winery. Tasting Room and Event Center. Complementary tastings. Friday night music and special events. New Bocce Court. Open Noon to 7:30 pm Tuesdays through Saturdays. Missoula's immediate surroundings offer a wide array of activities for all seasons, including the outdoor recreation afforded by vast tracts of public lands, the Old West flavor of several nearby ghost towns, several ski slopes, and a range of unique Montana businesses. An hour south of Missoula on US-93, the small town of Hamilton offers several worthwhile attractions and proximity to the spectacular Bitterroot Mountains. Hidden Legend Winery , just to the north of Hamilton on US-93, offers tastings of several varieties of mead (honey wine). The winery also produces dandelion wine. Bitterroot Brewery  in Hamilton serves about six of its microbrews on any given date. Their taproom and restaurant also occasionally hosts live music. The Daly Mansion  preserves the summer home of mining magnate Marcus Daly, one of Montana's founding fathers. About 40 minutes' drive southwest of Missoula, the Lolo Hot Springs offer two pools fed by geothermal springs: an outdoor swimming pool and a hotter (110-116 degree) indoor soaking pool. The springs are clothing-optional after 9 PM on Wednesday and Sunday nights. More adventurous soakers may prefer to hike out to some natural hot springs just across the Idaho border (about an hour from Missoula). Driving from Montana, the Jerry Johnson hot springs' trailhead will be the first. The trailhead is clearly marked--watch for a suspension bridge crossing the river to your left. The springs themselves are less than a mile hike in, and are large enough to accommodate a couple of dozen people. These springs are also clothing optional. If the springs are packed, as they often are, try hiking a quarter-mile further down the trail to two smaller hot springs. Weir Hot Spring is a smaller hot spring about five miles further down the road from Montana. It is about a mile in on a narrow and hilly trail, which can be treacherously icy in the winter and spring. Although the drive is longer and the hike harder, visitors to Weir are compensated by smaller crowds than at Jerry Johnson. In addition, the Forest Service allows camping at Weir, unlike at Jerry Johnson. The Montana Snowbowl , just north of Missoula, sports 950 lift-served acres. Pattee Canyon has nordic ski trails groomed regularly when theres enough snow by the missoulanordic.org club, for skating and classic techniques with mostly easy flat terrain, though its often icey. Lolo Pass, 45 miles southwest of Missoula, has good nordic Ski trails groomed saturday/sunday early mornings by the Clearwater National Forest contractor, which offer excellent classic and skating tracks. Theres also a warming hut and a staffed lodge at the pass. Garnet Ghost Town , about an hour's drive east on MT-200, is the closest significant ghost town to Missoula. Maintained by the BLM in a state of suspended decay, the small mining camp of Garnet is an open-air museum of gold rush life on the frontier. It is only accessible by car during the summer and early fall, but two cabins in the town are rented through the winter to adventurous skiers or snowmobilers. Glacier National Park is three hours' drive north on US-93. This page was last edited on 16 November 2017, at 02:25.